2012: THE TIME OF YOUR LIFE! Did you wake up this morning with palpable expectancy and corresponding excitement about living another day with your heavenly Father and your Lord Jesus Christ? 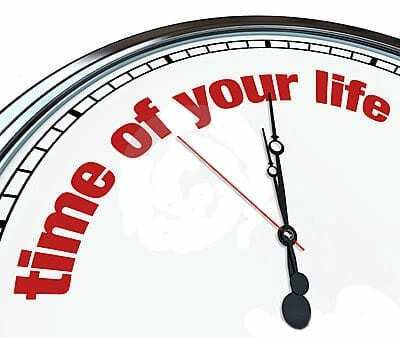 Do you think there is a possibility that today will be “the time of your life”? That’s an interesting phrase, isn’t it? And if we look at it in regard to the biblical Greek words kairos and chronos, it is right on. Chronos means, “the entity of time itself,” while kairos means, “a particular, defining moment.” In other words, chronos is made up of kairos moments. As our English phrase, “the time of your life,” has come to be used, “the time” refers to an event that is the best thing you have experienced in “your life” to date. Of course, every day is “the time of your life.” Sure, because the time of your life is passing in a linear way, and each day another 1440 kairos minutes are gone. So how did you spend your 525,600 kairos moments in 2011? OK, you need some sleep, you need to work to provide for yourself and your family, you need to buy food and eat it, you need some exercise (mowing? ), and of course you need to wait in line at the (fill in the blank). What else do you need to do? That depends upon how you view your life and what is your standard for Truth. If you take the Word of God seriously, you need to do the following: trust God, make His written Word your own, teach it to others, get involved in the lives of others with whom you are on a mission from God, keep the unity of the spirit in the Body of Christ, share of your financial resources to help others, live an unblemished life, and fulfill your spiritual calling. (7) Remember, O God, that my life is but a breath; my eyes will never see happiness again. (8) The eye that now sees me will see me no longer; you will look for me, but I will be no more. (9) As a cloud vanishes and is gone, so he who goes down to the grave does not return. (6) Man is a mere phantom as he goes to and fro: He bustles about, but only in vain; he heaps up wealth, not knowing who will get it. (7) “But now, Lord, what do I look for? My hope is in you. I’d guess that you, like I, expect to live through each day to which you awaken. But in 2011, I unexpectedly lost some Christian friends to death. How would I live today if I knew it were my last day on earth? Given that the Lord Jesus could take all us Christians out of this world at any moment, I don’t know that today isn’t my last day! As 2 Peter 3:11 asks, in light of our hope: “…what kind of person should I be?…” I think I had best be spoudazo-ing my way through 2012. I trust you understand the little-known biblical truth that God is experiencing the time of your life with you in the same linear way you are, moment by moment. If you don’t, listen to this teaching on God’s Foreknowledge and Man’s Free Will. Although God knows your thoughts and what you intend to do, your free will choices do not exist for Him to know until you actually make them. In closing, do think about another interesting phrase: “spending your time.” “Spend” means to use up. We all “spend” money, but we can work and replenish our money supply. Not so with the time of your life. As we each painfully realize, once a moment passes, we cannot get it back, nor can we change the action we took in that moment. 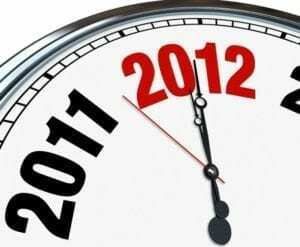 So here comes 2012, with another 525,600 minutes for each of us to spend. There are many dire economic, political, and cultural predictions for 2012, with perhaps the most sensational being the ancient Mayan calendar’s catastrophic “end of the world” this year. Scripture (and the evening news) clearly shows that the world is becoming more and more evil. Satan knows that the time of his disgusting life is one day shorter than it was yesterday, and he is ratcheting up his hateful assault on mankind in order to hurt God, Jesus, and people as much as he can before he is annihilated. The darker it is, the brighter a light appears to shine, and we who are taking advantage of what The Living Truth Fellowship has to offer can shine! We can meet the Enemy’s aggression with aggressive faith in our one and only GOD and our one and only Lord. This is the year when TLTF launches both The End Times and One Day With The Creator, and our vision is that God will use these unique Bible-teaching vehicles to reach more people than we can imagine. Please dig into our work and see if it touches your heart. Our teaching tapes, books, email communiqués, and live visits are designed to enrich your spiritual growth. Get a copy of The End Times class this month and show it to as many people as you can. Learn the Word therein so you too can teach it to others, as per 2 Timothy 2:2. Do what you can to support us financially, and please pray for doors of utterance so we can bring God’s precious Truth to others.